Three bedrooms, 2 baths, sleeps a maximum of 6 adults and 2 children, age 12 and under. 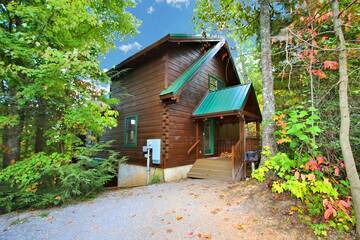 This beautifully furnished and decorated home 3-level cabin is perfect for a family getaway! The living area has vaulted ceilings, a wood-burning fireplace, pool table, 42" flat panel cable TV+DVD and free WiFi. The hot-tub deck with the great mountain view and a sitting area is accessible from the main level. The kitchen is fully equipped and has a large dining table for family meals. The king master bedroom is on the upper level and has a private bath, Jacuzzi tub and 17” flat screen cable TV+DVD. The second bedroom is on the lower level and has a queen bed with 24” flat screen cable TV+ DVD and the third bedroom is also on the lower level with one double bed with 24” flat screen cable TV+DVD. The lower level bedrooms share a full bath with a walk-in shower. There is a queen sleeper in the Theater room on the lower level with a 109" theater screen. This cabin also have a charcoal grill and a washer & dryer. Three bedrooms, 4 baths. Sleeps 6 adults and 4 children, age 12 and under. Everybody needs a little “Stress Relief” once in a while and our newest 3 bedroom luxury chalet is designed to offer everything you need to let off a little steam. Do you need a quick getaway with friends or a week-long family vacation? Whatever the need…from the time that you enter on the main level into the spacious kitchen/living and dining area to the time that you sit yourself down in the hot-tub to enjoy the fabulous mountain view, you’ll be wondering what you were so “stressed” about! Forget about missed deadlines, voice mail messages and endless meetings! Instead why don’t you watch a great old movie or enjoy your favorite sports team on the 109" screen with your old college friend, or play a game of pool or air hockey with dad or your favorite uncle? No matter what challenges your everyday life throws your way, we guarantee that a few nights at “Stress Relief” will have you stress-free before you have to go back to reality! All 3 bedrooms have a king bed with private bath, Jacuzzi tub and a 20" flat screen satellite TV+DVD There is a queen sleeper in the living area for the kids with a gas fireplace and a 37" flat panel satellite TV+DVD. The large fully equipped kitchen and dining area are perfect for enjoying a meal with the whole group. The lower level features a Theater room with 109" screen with true theater seating and queen sleeper for the kids as well as a game room with a pool table, foos ball table and air hockey with a wet bar and full bath. There are 2 decks with rocking chairs for enjoying the mountain air and the great view or sit in the hot-tub and soak awhile. This cabin also offers a washer & dryer and charcoal grill. 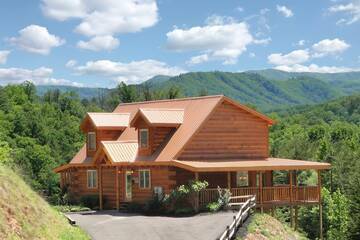 It is located between Pigeon & Gatlinburg – not more than a 5 or 10 minute drive to either area and has easy access to the Great Smoky Mountain National Park by the Gatlinburg bypass.